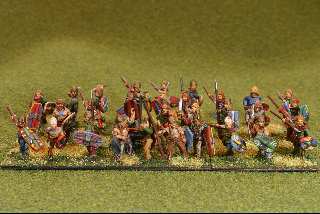 This article shows a miniature army in 15mm scale painted andbased for the miniatures game De Bellis Antiquitatis .Each army consists of 12 stands (known in the game as elements) of 2 to 4 figures per stand.The II/53 Ancient British Army representswarriors of 55 B.C. to 75 A.D. who lived and foughton the British main island.The time frame represents the battlesfrom Caesar's first explorations of Great Britainto the conquering battles of Emperor Claudius.There is more fascinating reading at Roman-Britain.organd at the Red Rampant Roman history site. The Ancient British army has one variant with a many options. They area docile army in DBA with an aggression rating of 0.In DBA the attacker is decided by a high die roll modified by your army's aggression. 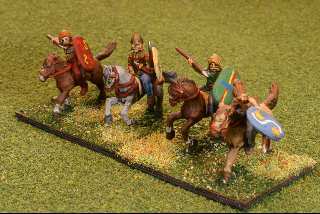 This list shows that the General can be in a Light Chariot (LCh) or Warband (Wb with 3 or 4 figures).Then 2 Light Horse (2LH) are mandatory as are 5 Warbands of 3 figures (5x3Wb).Options include having 3 Light chariots (LCh), psilois (Ps), or warbands (Wb),and one final warband or psiloi.In all one must have exactly 12 stands. 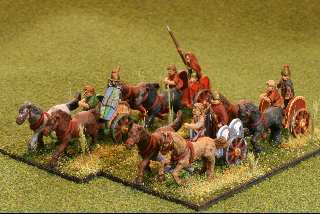 To the right we see a photo of 4 light chariots.The driver stands forward on the chariot cross bar.The warrior or king stands behind and hurls spears.One chariot has a woman with long hair, most likely Queen Boudicca who leda major revolt against the Romans before being killed.The figures here are Corvus Belli figures.This is the DBA box set that provides enough figures for any option Ancient British army listed above. To the right are 9 stands of 3 warband figures.In the front center is 1 stand of 3/4 warband figure with banners and carnyx horn.The Corvus Belli figure detail is excellent.You can see eyelids, hair, and weapon detail very clearly, thus making them easy to paint.Also, the figures are very varied and each warband stand is different.Some of the figures have the punk rock type hair that the Celts made by combingwhite lime dust into the hair. 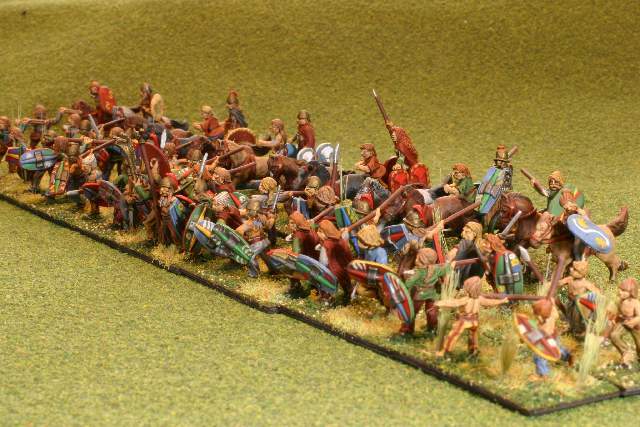 Since the Ancient British are mostly warband, you probably will stack them two stands deep to getthe +1 combat roll against foot soldiers (not cavalry, light horse, bows, or psilois).The most common enemy will be the Romans, especially blades and spears. 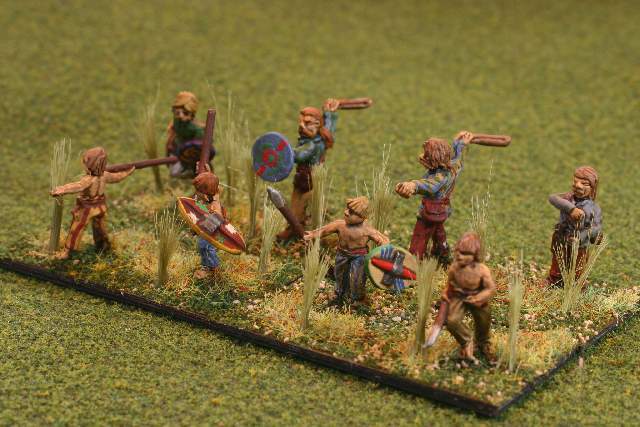 This is good becausewarbands will kill spears and blades if they outroll them.Unfortunately Blades roll +5 and Spears roll +4 versus a Warband +3. So stack the warbands up andgo for the quick kill. To the right is a photo of the Ancient British light horse.Each one is different.I painted the wicker shields with a tribal design.I don't think any examples of painted shields survive fromthe dates of the Ancient British, but we can tell fromcoins and other artifacts that theyrevered horses and animals, the sun and the moon,and other early Pagan symbols. These Brits took a long time to paint because I painted striped andcheckered clothing on many of them.No tartans, but a lot of small cross hatches on the cloths.Also, I painted lots of designs on the shields.No two figures have the same paint scheme. 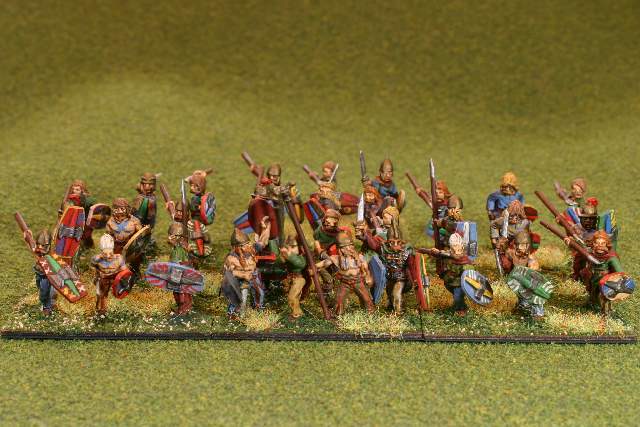 To the right are 4 stands of psilois (skirmishers).Again, Corvus Belli has done a great job, and all are different.What's great is that 4 of the psiloi figures are juvenile boys!Excellent, I love the idea of a tribe sending young ones into warto see what it is all about. Run forward everyone!With great shrieks, taunts, and blowing of the carnyx horns,run forward. Attack the invaders! Last modified: Thursday, 09-Jun-2011 12:41:42 MST.